If you like exercises in style, you'll love Mad Max: Fury Road. I liked it a lot, yet in that difference between like and love lies something I want to talk about. Like many successful fantasy and science-fiction films - Conan The Barbarian and The Fifth Element spring to mind - Fury Road can be understood as a sort of visual poem. So much thought has gone into the look of the film that it staggers me. The cinematography, vehicle design, the costumes - the way every character is designed and presented as an archetype from the pages of a graphic novel - all of it is nothing short of brilliant. The same care and attention seems to have gone into someone on screen for 30 seconds as it has to those characters who carry the story forward. 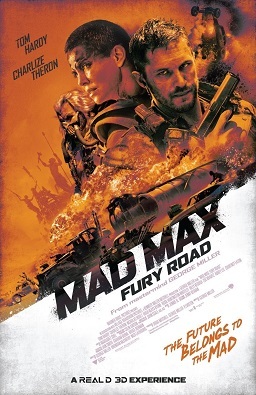 Fury Road doesn't reject plot, but sketches it with the clean and simple lines of pulp fantasy and SF. The great thing about pulp is that it tends towards the condition of mythology - great themes like redemption, revenge, competition for resources, tyranny and freedom rise to the surface without needing to be spelled out. And don't challenge the primacy of the visual experience. It's also to the credit of the script that it avoids the Freudian pitfalls a film depicting the post-apocalyptic power-trips of manly men could so easily fall into. Making Charlize Theron's Imperator Furiosa the real protagonist and rescuer of the villain's chattel-slave wives (who all grasp their own agency over the course of the film) inoculates the film against explicit or implicit misogyny. Meanwhile, Tom Hardy and the rest of the cast do a tremendous job of suggesting purpose without need for supernumerary dialogue and extensive backstories. The contrast to Avengers: Age of Ultron on all these points is striking. Mad Max began in the shadow of the oil shock - but with every episode the series has moved further away from any loose association with reality into future kitsch. With Fury Road, the latest and greatest installment, some sort of final stylistic yet ultimately hollow destination has been reached. It could be the best translation to the screen of baroque post-apocalyptic tropes. It might be the most Games Workshop-esque film ever. It's certainly a darn good film. But when all's said and done, Fury Road remains an act of self-cannibalisation, devouring the original trilogy and thirty years of artistic responses in cinema, comics and in games to create a definitive pastiche. It might be a breathtaking, brilliant exercise in pastiche, but it's still a pastiche. And in that lies both its limitation. I'm glad I'm not the only one who thought of Games Workshop while watching the film! I watched it today and enjoyed it immensely. I think it's the definitive post-apocalyptic-humanity-gone-pear-shaped-desert-chase film.